This week I read one of the best emails of the year. At this point I stopped reading and my heart started pounding in my chest. WHAT? How? Did I win? Why didn’t I know this? How is that a national newspaper in Spain knows this and not me? Where’s the email from the IPA telling me I won? How did I miss THAT email?! I was quite baffled, to say the least! What are the IPA Awards and why are they a big deal? 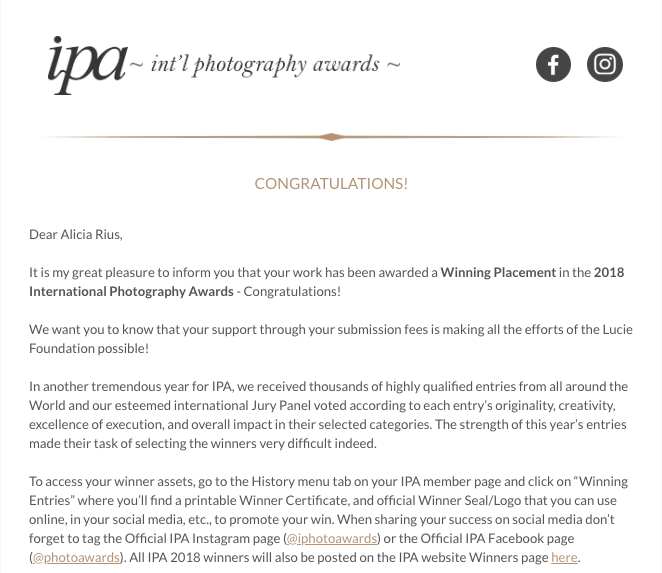 The International Photography Awards conducts an annual photography competition for	professional, non-professional, and student photographers on a global level, creating one of the most ambitious and comprehensive competitions in the photography world today. The IPA recognizes photography’s leading talents who are creating, shaping and defining the world of photography today. So, I started browsing my emails desperately trying to make sure this wasn’t a mistake. I knew I had submitted my series to the IPA contest but then I thought: if I win, they will let me know. If I don’t heard back, is because I didn’t win. With that in mind, I submitted my work and forgot about it. After frantically scrolling through my emails with my finger, I finally found the email from IPA telling me I won the 3rd Place in the Pets Category. I started jumping and throwing my arms in the air with teary eyes. I think I even hugged myself at some point. My husband looked at me and was like, “What’s going on?” I told him about the award, but if you are not a photographer, it’s quite hard to understand the magnitude of such an accomplishment. Even just an Honorable Mention in the contest is worth celebrating! I’ve been submitting my work to the IPA for years. Despite not being selected any time, I kept trying, as my skills and vision as a photographer became better and better. I have always submitted my personal projects and never commissioned work. Why? Because personal projects say who you are as a photographer. The idea is 100% yours, they are a clear example of your vision, and they speak volumes about your capacity as a professional to transform an idea into a reality. So when you are awarded with a personal project, YOU are awarded. The award is a recognition of your talent and who you are as a photographer. A recognition of your efforts, drive, focus and capacity to tell a story with unique frames. My point is this: never stop trying. Keep working and practicing. Try different things and challenge yourself. Trust your gut and go for the projects you feel passionate about. Don’t be intimidated about the scope of it or how much money it will cost. Don’t look at it as a cost in time or money, but rather as in investment. Invest in you, in your vision. Because if you don’t, nobody else will do it for you. And if you want to know what it took to turn and idea into a reality, check out this post where I talk in detail about the entire creative process behind this personal project. More info about the series here.